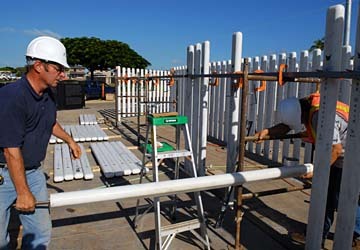 Johann Skaftason, left, and Dean Johnson prepare to anchor one of 429 white marble granite standards at a new memorial on Ford Island honoring the battleship USS Oklahoma, which was sunk on Dec. 7, 1941. Each standard bears the name of a crew member from the Oklahoma killed 66 years ago. The chaos and dying are etched in the memory of Aiea resident George Brown, who lost 429 shipmates when the battleship Oklahoma was sunk 66 years ago during the Japanese attack on the Pacific Fleet at Pearl Harbor. "That was the most horrible scene that you could ever think of," said Brown, 86, who has lived in Hawaii since the end of the war. 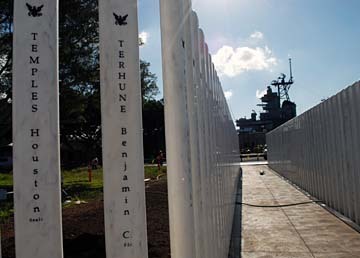 Brown's words are now etched in one of the black granite walls that are part of a $1.1 million memorial honoring the battleship USS Oklahoma and its crew. The Ford Island memorial will be dedicated next Friday. Recognition of the battleship, which never entered the Pacific war after it was refloated, and its crew is long overdue. It is the only ship sunk by the Japanese that does not have its own memorial. "I think it's been too long in coming," said Brown. Four rows of gleaming white Vermont marble standards have been erected within a few feet of Fox 5 Pier, where the 32,000-ton battleship was moored on Dec. 7, 1941. Each 7-foot column, weighing about 120 pounds, bears the name of an Oklahoma crew member. For many of them, this will be the only monument bearing their name, since many of Brown's shipmates are buried at the National Memorial Cemetery of the Pacific under headstones simply engraved "Unknown." "Like anything made from marble," said Tulsa, Okla., craftsman Johann Skaftason, "it will last forever. "This is the most unique project I have worked on," said Skaftason, president of Eurocraft, a marble and stone fabrication company, about the memorial designed by Tulsa, Okla., architect Don Beck. Besides the 429 white standards, the memorial will feature black granite walls where the history of the Oklahoma is inscribed along with a schematic of the battleship and tributes to honor the sacrifices of its crew. Doug Lentz, National Park Service superintendent of the USS Arizona Memorial, said the Oklahoma suffered the second-largest loss of American lives on Dec. 7, 1941. Rows of 7-foot marble standards are shown. The biggest loss was on the USS Arizona, where 1,177 sailors and Marines were killed. Seventeen survivors from the Oklahoma, including Brown, are expected to attend the memorial's dedication. The 583-foot battleship was among the nine ships moored along Battleship Row near Ford Island. It was anchored near the battleship USS Maryland where the USS Missouri is now berthed as a floating museum. Its port side was torn apart by at least eight Japanese torpedoes. Within 20 minutes after the attack began, the Oklahoma had swung over until halted by its masts touching bottom, its starboard side above water and a part of its keel clear. More than 400 crew members were trapped in its hull. Only 32 were rescued. Lentz said the Oklahoma memorial, created by a federal law authored by Rep. Tom Cole of Oklahoma in January 2006, is located on nearly an acre of land. The memorial is being built with $350,000 donated by the Oklahoma Centennial Commission and private donations. Brown was a 20-year-old cook when the Japanese attack occurred, and had been up since 5 a.m.
"I was sitting on my bunk addressing a letter to my mother when the attack occurred," he recalled. "I ran to my battle station, which was one level below the deck." During that brief period, Brown recalls that at least four torpedoes slammed into the Oklahoma. "One of those torpedoes probably saved my life," he said. "The water swept me into the next compartment," Brown added. He managed to climb up a ladder and onto the battleship's deck.